There, he shared a room with Heinrich Wilhelm Ernst, another incredible violinist (I wonder how there was room for two violin-sized egos in one apartment!). Ole Bull did not do that well in Paris. He had a hard time being recognized as a serious musician. After hearing Paganini play, however, everything changed. He began to imitate both Paganini's style of playing, and his mannerisms, while lending his own touch as well. This, in fact, proved quite advantageous for Ole. He began to play many more concerts, as many as 275 in one year! He played with Franz Liszt and was known by Robert Schumann. He also began to amass quite the fortune as well. In fact, in 1837, Ole purchased a luxurious carriage to make traveling to concerts easier. This carriage, because of its size, could transport his entourage, and, because of its opulence, sparked interest everywhere he went! Still, he was not as successful in Europe as he had hoped to be. So, he began to give concert tours of America. In fact, he toured America 5 times in the 1840's to the 1860's, during which time he acquired a real fondness for our fair land. Later on, he would purchase a large plot of land in Pennsylvania, (about 11,400 acres!) to create a sort of utopian colony for Norwegian immigrants to settle in. This land became Ole Bull State Park in later years, during the time of the Civilian Conservation Corps of Franklin D. Roosevelt. Ole Bull was also a real advocate for Norway becoming a sovereign state, separate from Sweden. This did not happen in his lifetime, but his mark was definitely on the movement. He, in fact, co-founded the Det Norske Theater in Bergen, which was the first theater to have the players speak in Norwegian, instead of Danish. Oh, and I almost forgot! Ever heard of Edvard Grieg? ("Anitra's Dance," "In the Hall of the Mountain King," "Peer Gynt?") Well, if it weren't for Ole Bull, you might never have heard of him. 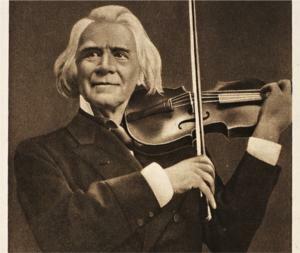 It was Ole who was responsible for recognizing Grieg's talent and convincing his family to send him to the Leipzig Conservatory. Ole had a fine collection of violins, as well. 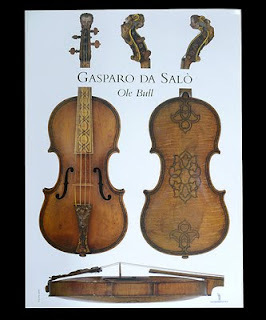 Amatis, Stradivarius', Guarneris, but his violin, the one that he is really known for, is the Gasparo da Saló that he played. 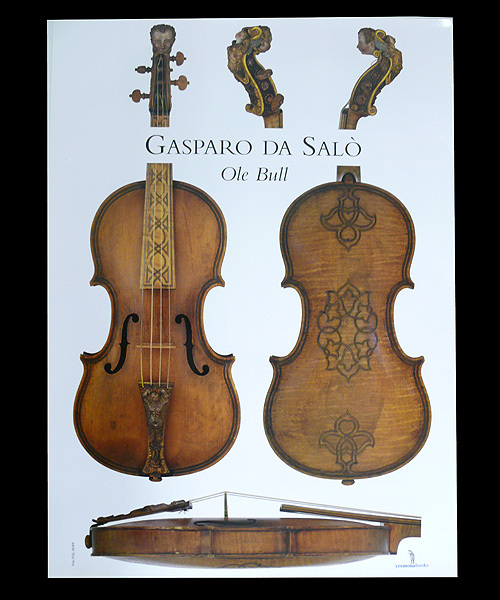 In fact, this violin is now on display in the Vestlandske Kunstindustrimuesum in Bergen. Ole was a master of marketing. Before ever leaving for America, he had soaps, perfume bottles, and cosmetics made with his picture on them. These were shipped and sold in America long before he himself ever arrived, making his name and face already recognizable. Because of this, Ole Bull was already a household name by the time he arrived for his concert tours. America, in fact, is where he amassed most of his fortune, since he routinely made quite a profit from each of his concerts (somewhere in the order of $2,000 per concert...and that is in 1850 dollars!). After the death of his first wife, Ole Bull met and married Sara Thorp, who was the daughter of an American Senator. In true rock and roll form, there was controversy and sensationalism attached to this as well.....Sara was 40 years younger than Ole. In short, Ole Bull was much more than a musician, or a successful musician. He was an innovator, a marketing genius, an actor, and a man who lived doing exactly what he wished for his life. He had high ideals, both for his country as well as for himself, and lived grandly and opulently, as well as idealistically. Fantasy Role Play... Band Camp: for Strings!